Invasive Species Awareness Week July 12 – 18, 2015! You are here: Home / Events of Interest / Invasive Species Awareness Week July 12 – 18, 2015! July 12 – 18, 2015! Invasive species affect all New Yorkers – from hikers to highway personnel, from birders to boaters and from farmers to foresters. 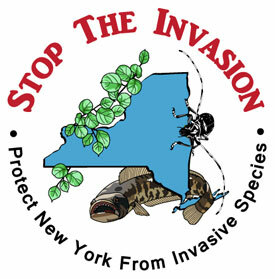 The mission of the New York Invasive Species Awareness Week (ISAW) is to promote knowledge and understanding of invasive species to help stop their spread by engaging citizens in a wide range of activities across the state and encouraging them to take action. Everyone is encouraged to attend and learn more about invasive species. During ISAW, you can volunteer to help remove invasive species, get out on the trails or on the water to see invasive species firsthand, attend presentations to learn more about what you can to do help fight these threats, and much more.